Exposure of macrophages to LPS induces a state of hyporesponsiveness to subsequent stimulation with LPS termed LPS desensitization or tolerance. To date, it is not known whether similar mechanisms of macrophage refractoriness are induced on contact with components of Gram-positive bacteria. In the present study, we demonstrate that pretreatment with highly purified lipoteichoic acid (LTA) results in suppression of cytokine release on restimulation with LTA in vitro and in vivo in both C3H/HeN and C3H/HeJ mice, but not in macrophages from Toll-like receptor (TLR)-2-deficient mice. Furthermore, desensitization in response to LPS or LTA exposure also inhibits responses to the other stimulus (“cross-tolerance”), suggesting that signaling pathways shared by TLR2 and TLR4 are impaired during tolerance. Finally, we show that LPS- or LTA-induced cross-tolerance is not transferred to hyporesponsive cells cocultured with LPS/LTA-responsive macrophages, showing that soluble mediators do not suffice for tolerance induction in neighboring cells. Endotoxin or LPS, a glycolipid of the cell membrane of Gram-negative bacteria, is one of the most potent known stimulators of immune responses, inducing cytokine production by monocytes and macrophages (1). Although cytokine production is indispensable for the efficient control of growth and dissemination of invading pathogens, a dysbalanced inflammatory response is potentially harmful to the host and may lead to microcirculatory dysfunction, causing tissue damage, septic shock, and eventually death (2, 3). The phenomenon of endotoxin tolerance could represent a host mechanism aimed at limiting inflammatory damage on activation of the immune system by Gram-negative bacteria or their products. The term endotoxin tolerance (also called LPS hyporesponsiveness or refractoriness) describes the observation that pretreatment of experimental animals with an initial low dose of LPS confers protection against the detrimental consequences of a subsequent high dose of LPS (4, 5). This protection is associated with an attenuated inflammatory response to LPS attributable to a down-regulation of macrophage responsiveness (6, 7, 8). A similar status of reprogrammed mediator release after primary stimulation is induced in vitro by exposure of macrophages to LPS several hours or days before rechallenge (9, 10, 11, 12). In contrast to the endotoxin of Gram-negative bacteria, no single constituent has so far been identified as the major immunostimulatory element in Gram-positive bacteria. In the last years, increasing evidence has been provided that lipoteichoic acids (LTAs)3 and peptidoglycans could substitute for whole Gram-positive bacteria in activation of macrophages and induction of multiorgan dysfunction syndrome (13, 14). Recently, it has been shown that signal transduction and cytokine production in response to several Gram-positive bacteria, peptidoglycan, and lipopeptides from various bacterial species is mediated by a cellular transmembrane receptor termed Toll-like receptor (TLR)-2 (15, 16, 17, 18, 19, 20, 21). However, controversial data have been published regarding the involvement of TLR2 or TLR4 in LTA-induced signaling (16, 17). Although previous experiments with bacterial DNA (22), lipopeptides (23, 24), or whole bacteria (23) indicated that down-regulation of macrophage responsiveness after stimulation was not restricted to endotoxin from Gram-negative bacteria, it has not been studied whether and how macrophage responsiveness is modulated by LTA. For this purpose, we studied the effect on cytokine production of low-dose pretreatment with LTA or LPS followed by a second LTA/LPS challenge in vivo and in primary murine macrophages in vitro. By using mice lacking functional TLR4 (C3H/HeJ) or TLR2 (TLR2 knockout) we demonstrate macrophage desensitization on preexposure to LTA via TLR2 but independent of TLR4. Male C3H/HeN and C3H/HeJ and female CD1 mice were purchased from Charles River Laboratories (Sulzfeld, Germany). TLR2 knockout mice were generated by homologous recombination by Deltagen (Menlo Park, CA) and kindly provided by Tularik (South San Francisco, CA). Heterozygous mice were interbred with CD1 mice to obtain homozygotes. Female TLR2-deficient mice and CD1 control mice were used for experiments. They were kept at 24°C, 55% humidity, 12-h day-night rhythm on a diet of Altromin C 1310 (Altromin, Lage, Germany) and were used at 8–10 wk of age. All animals received humane care in accordance with the National Institutes of Health guidelines and the legal requirements in Germany. Staphylococcus aureus (DSM 20233) was grown in a 42 l fermentor (MBR BioReactor, Wetzikon, Switzerland) and harvested at an OD578 of 15. After resuspension in 0.1 M citrate buffer at pH 4.7, bacteria were disrupted with glass beads in a Braun disintegrator, washed, and stored at −80°C. A defrosted aliquot of bacteria (100 ml) was mixed with an equal volume of n-butanol (Merck, Darmstadt, Germany) under stirring for 30 min at room temperature. After centrifugation at 13,000 × g for 20 min, the aquatic phase was lyophilized, resuspended in 50 ml of chromatography start buffer (15% n-propanol in 0.1 M ammonium acetate, pH 4.7), and centrifuged at 45,000 × g for 15 min. The supernatant was subjected to hydrophobic interaction chromatography on an octyl-Sepharose column (2.5 × 11 cm) with a linear gradient from 15 to 60% of n-propanol in 0.1 M ammonium acetate, pH 4.7. This LTA preparation contained <0.08 endotoxin units per milligram of LTA (6 pg LPS/mg LTA), as assessed by Limulus amoebocyte lysate assay (BioWhittaker, Verviers, Belgium). No contamination with lipopeptides was detected by photometric measurements (UV absorption), silver staining on SDS-PAGE, amino acid sequencing (Edman degradation and HPLC), and nuclear magnetic resonance examination. A more detailed characterization of the LTA preparation has been published elsewhere (25). Mice were killed by terminal pentobarbital anesthesia (Narcoren; Merial, Hallbergmoos, Germany), and 10 ml of ice-cold PBS (Life Technologies, Karlsruhe, Germany) was injected into the peritoneal cavity. Animals were shaken gently and the lavage liquid was transferred to siliconized glass tubes (Vacutainer; Becton Dickinson, Heidelberg, Germany) for isolation of peritoneal cells. After centrifugation, cells were resuspended in medium (RPMI 1640; BioWhittaker) containing 10% FCS (Boehringer Mannheim, Mannheim, Germany) and 100 IU/ml penicillin/streptamycin (Biochrom, Berlin, Germany) and transferred to 96-well cell culture plates (105 cells/well). For determination of cytokine induction by LPS or LTA, cells were stimulated immediately with pyrogen-free saline (Braun, Melsungen, Germany), increasing concentrations of LPS (Salmonella abortus equi; Metalon, Wustenhofen, Germany), or LTA (S. aureus), respectively, at 37°C, 5% CO2 in a humidified atmosphere for 6 h.
To study desensitization, cells from C3H/HeN and HeJ mice were incubated in medium with increasing concentrations of LPS or LTA for 20 h. Cells then were washed twice with PBS, and new medium was added. Cells were challenged with either 10 ng/ml LPS or 10 μg/ml LTA for 6 h.
To determine the involvement of soluble factors in tolerance induction, equal numbers of peritoneal cells from C3H/HeN and HeJ mice were pooled and preincubated with medium, 1 ng/ml LPS, or 10 μg/ml LTA for 20 h before restimulation with 10 μg/ml LTA for 6 h.
In analogy, equal cell numbers from CD-1 wild-type and TLR-2−/− mice were preexposed to medium, 10 ng/ml LPS, or 10 μg/ml LTA for 20 h and restimulated with 100 ng/ml LPS for 6 h. TNF was determined in supernatants by ELISA. Lavaged peritoneal cells did not differ in number and proportion of macrophages between the different strains of mice used. Furthermore, the cytokine release in response to LPS as well as LTA per cell was very homogenous, supporting the notion that differences were not attributable to a different composition of the cell population plated. Mice were injected i.p. with pyrogen-free saline, 3 μg/kg LPS, or 15 mg/kg LTA in pyrogen-free saline 24 h before challenge. For induction of liver damage, mice were starved overnight and injected i.p. with 5 μg/kg LPS or 25 mg/kg LTA with 1 g/kg galactosamine (GalN; Roth Chemicals, Karlsruhe, Germany) diluted in saline. After 90 min, blood was obtained from the tail vein for determination of plasma TNF. The extent of liver damage was assessed 8 h after challenge by measuring plasma alanine aminotransferase activity with an EPOS 5060 analyzer (Netheler & Hinz, Hamburg, Germany; Ref. 26). TNF-α in supernatants was determined by ELISA with specific Abs purchased from BD PharMingen (Hamburg, Germany). For the detection of TNF in plasma samples, the OptEia kit from BD PharMingen was used. The detection limits were 5 pg/ml. Data are presented as means ± SEM. Statistical differences were determined by one-way ANOVA followed by Tukey’s multiple comparison test or Dunnett’s multiple comparison test of all groups vs the control group. Data derived from experiments with nonpooled cells from individual mice were analyzed by using Dunnett’s multiple comparison test after repeated-measures ANOVA to account for the interindividual differences. Statistical evaluation of results presented as percentage was performed with raw data. In case of unequal variances (Bartlett’s test p < 0.05), data were first log-transformed. p < 0.05 was considered significant. All tests were performed with GraphPad Prism, version 3.0 for Windows (GraphPad Software, San Diego, CA). Peritoneal macrophages from LPS-hyporesponsive C3H/HeJ mice exhibit normal TNF release upon stimulation with LTA. Peritoneal cells (105) from C3H/HeN (n = 6) and C3H/HeJ mice (n = 6) were stimulated with increasing concentrations of LPS (A) or LTA (B) for 6 h. Data are presented as means ± SEM. ∗, p < 0.05; ∗∗, p < 0.01 vs respective control group (NaCl) based on ANOVA, followed by Dunnett’s multiple comparison test. Impaired TNF release in response to LTA by TLR2−/− macrophages. Peritoneal cells (105) from three wild-type CD-1 mice and one TLR2−/− mouse were stimulated with different concentrations of LPS or LTA for 6 h in triplicates. Data are presented as means ± SEM. ∗, p < 0.05; ∗∗, p < 0.01 vs respective control group (NaCl) based on ANOVA, followed by Dunnett’s multiple comparison test. Prior exposure to LPS renders cells hyporesponsive to subsequent stimulation with LPS. We tested whether prior exposure of cells to highly purified LTA induced refractoriness to subsequent stimulation with LTA comparable to LPS tolerance. Release of TNF in response to 10 μg/ml LTA was decreased in a dose-dependent fashion when primary murine peritoneal cells were pretreated with different concentrations of LTA for 20 h before restimulation (Fig. 3⇓A, right). Previously, it has been shown that IL-1 and LPS could substitute for each other in the induction of refractoriness in vitro (30, 31), suggesting that hyporesponsiveness was attributable to impaired function or expression of signaling intermediates shared by IL-1 and LPS. As many of these factors are involved also in signal transduction via TLR2 (32, 33, 34), we sought to determine whether, in analogy to IL-1, pretreatment with LTA had an inhibitory effect on LPS-induced signaling and vice versa. 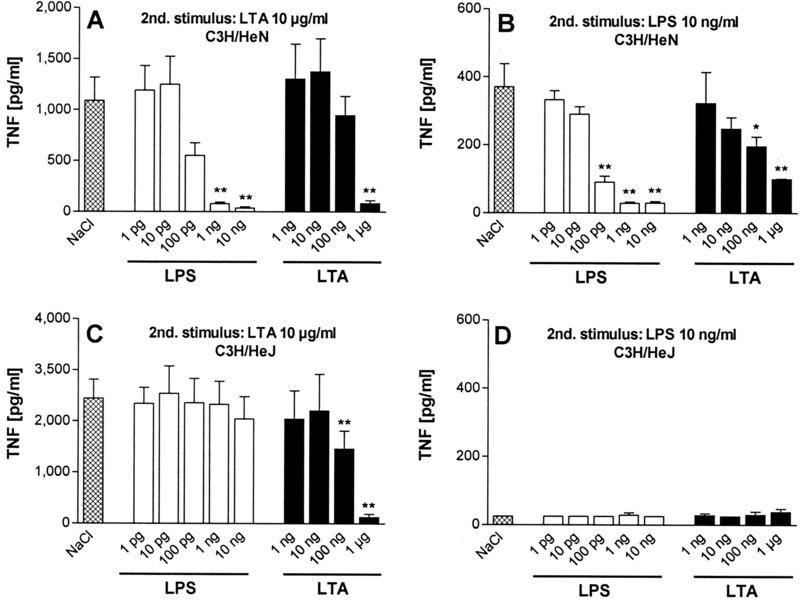 Indeed, exposure of cells to LTA also induced hyporesponsiveness to subsequent stimulation with LPS (Fig. 3⇓B, right). Similarly, LPS induced cellular refractoriness to both LTA and LPS (Fig. 3⇓, A, left and B, left). The same experiments, as controls, were performed with cells from LPS-hyporesponsive C3H/HeJ mice. As expected, no cytokine release was found on restimulation with 10 ng/ml LPS (Fig. 3⇓D), whereas LTA-induced release of TNF from saline-preexposed HeJ macrophages was comparable to cells derived from HeN mice (Fig. 3⇓C, left). In contrast to wild-type cells, HeJ macrophages were not rendered LTA-tolerant by preexposure to LPS, whereas pretreatment with LTA inhibited cytokine release (Fig. 3⇓C). Induction of cross-tolerance by LPS and LTA. 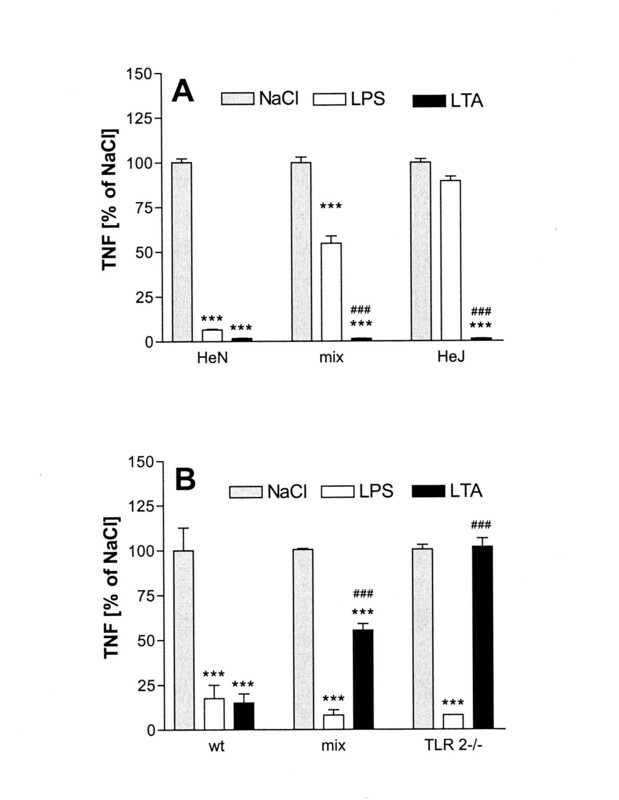 Peritoneal cells (105) from C3H/HeN (n = 4) and C3H/HeJ mice (n = 4) were preexposed to saline (▩) or increasing concentrations of LPS (□), or LTA (▪) for 20 h. After washing, cells were restimulated with 10 μg/ml LTA (A and C) or 10 ng/ml LPS (B and D) for 6 h, and TNF was determined in supernatants by ELISA. Representative data from one of three independent experiments are presented as means ± SEM. ∗, p < 0.05; ∗∗, p < 0.01 vs respective control group (NaCl) based on repeated measurement ANOVA, followed by Dunnett’s multiple comparison test. These results clearly demonstrate the requirement of functional TLR4 for induction of LTA-tolerance by LPS but not by LTA itself, which renders cells refractory independently of TLR4. In contrary, experiments conducted with cells from TLR2-deficient mice (Fig. 5⇓B, right) identify TLR2 as the receptor transmitting tolerance induction by LTA: TLR-2-deficient cells were not affected by pretreatment with LTA with regards to subsequent LPS-inducible cytokine release. Administration of endotoxin in vivo induces a state of tolerance to the toxicity of subsequent endotoxin challenge in models of LPS shock and LPS-induced liver injury (35). 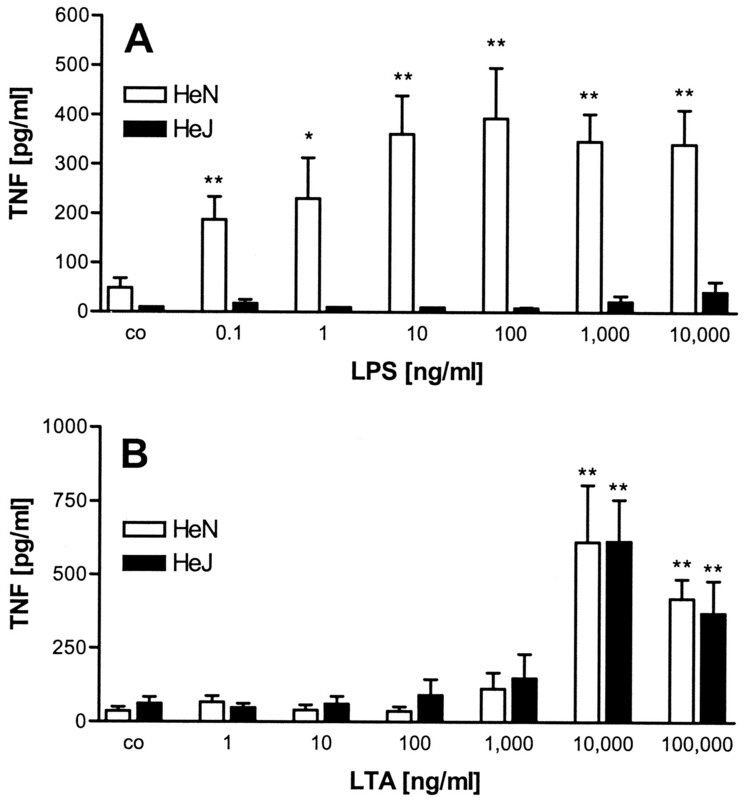 Although suppression of LPS-induced cytokine production, especially of TNF, in tolerant animals is often put forward to explain the protective effect of endotoxin tolerance and ex vivo data confirm hyporesponsiveness of macrophages isolated from LPS-pretreated animals (36), the relationship between in vitro desensitization of macrophages and in vivo tolerance induction has not been delineated fully (37). To determine whether the phenomenon of cross-desensitization by LPS and LTA observed in vitro can also be reproduced in vivo, we performed animal studies, injecting LTA or LPS 24 h before induction of liver damage by galactosamine plus LPS/LTA. Saline-pretreated mice exhibited elevated TNF plasma levels in response to GalN + LPS (5 μg/kg; only C3H/HeN mice; Fig. 4⇓A) or GalN + LTA (25 mg/kg; C3H/HeN, Fig. 4⇓B and C3H/HeJ mice, Fig. 4⇓C) and developed liver injury as assessed by plasma transaminase activity 8 h after challenge. In contrast, TNF levels and liver damage were significantly lessened when animals were injected with LPS (3 μg/kg) or LTA (15 mg/kg) 24 h before challenge. Similarly, as shown for isolated macrophages in vitro, LPS pretreatment was ineffective in C3H/HeJ mice challenged subsequently with GalN/LTA, confirming the requirement of TLR4-mediated signaling in tolerance induction by LPS in vivo (Fig. 4⇓C). Cross-tolerance by LPS and LTA in vivo. C3H/HeN (A and B) or C3H/HeJ mice (C) were injected i.p. with saline, 3 μg/kg LPS, or 15 mg/kg LTA 24 h before challenge with GalN/LPS (5 μg/kg; A) or GalN/LTA (25 mg/kg; B and C). TNF (□) and alanine aminotransferase activities (▪) were determined in plasma 90 min and 8 h after challenge, respectively. Data from four to six mice per group are presented as means ± SEM. ∗, p < 0.05; ∗∗, p < 0.01 vs respective control group (NaCl) based on ANOVA, followed by Dunnett’s multiple comparison test. Earlier reports suggested that refractoriness after preexposure of cells to endotoxin was mediated by endogenous factors such as IL-10, TGFβ, or IL-1 (31, 38). This led us to study the role of soluble mediators in tolerance induction in a coculture system by using mixed macrophages from wild-type and TLR-deficient mice. If desensitization was mediated by soluble factors released on stimulation with LPS, macrophages from TLR4-mutated C3H/HeJ mice cocultured together with wild-type macrophages should be rendered LTA-tolerant by LPS pretreatment. In cultures of macrophages from either C3H/HeN or HeJ mice and in coculture of both cell types, LTA pretreatment completely inhibited cytokine production in response to LTA challenge (Fig. 5⇓A). In contrast, preexposure to LPS only partially suppressed cytokine release by ∼50% in the coculture system, whereas complete inhibition was found in HeN cells (Fig. 5⇓A). Similar results were obtained with coculture of TLR2−/− and wild-type cells restimulated with LPS. In this setting, LPS pretreatment suppressed TNF production in wild-type, TLR2−/−, and mixed cells (Fig. 5⇓B). 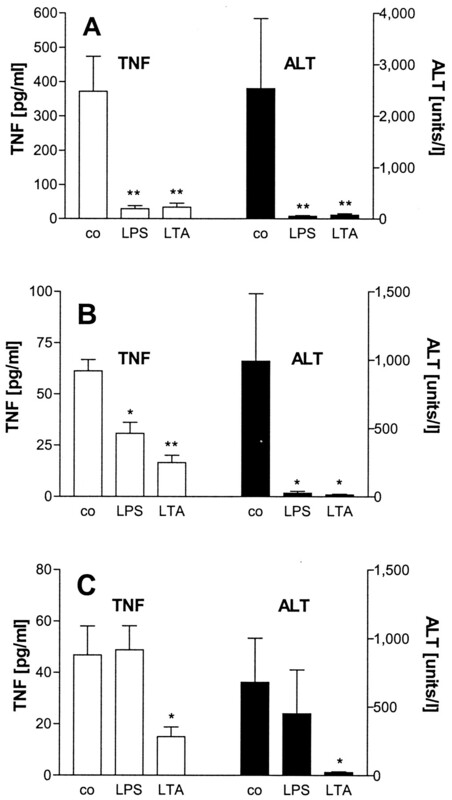 LTA pretreatment impaired cytokine production by wild-type cells but had no effect on TLR2−/− cells, whereas a 50% reduction of TNF was found in supernatants of cocultured cells (Fig. 5⇓B). These results indicate that in the coculture system, only the cells carrying functional TLR were desensitized, whereas the TLR4- or TLR2-deficient cells were unaffected by the LPS/LTA pretreatment. These findings suggest that soluble factors such as IL-10, TGFβ, or IL-1β that are released on contact with LPS or LTA are not responsible for suppression of TNF formation on secondary stimulation. Hence, direct signaling via the adequate TLR seems to be necessary for in vitro desensitization by LPS or LTA. A, LPS-induced cross-tolerance is not transferred to cocultured C3H/HeJ cells. Peritoneal cells (5 × 105/ml) from C3H/HeN or C3H/HeJ mice or mixed cells from both mouse strains (1 × 106/ml, 200 μl/well) were preexposed to medium, 1 ng/ml LPS, or 10 μg/ml LTA for 20 h, washed, and restimulated with 10 μg/ml LTA for 6 h for determination of TNF. Pooled data from two independent experiments performed in quadruplicates are expressed as percentage of respective saline control (NaCl) and are shown as means ± SEM. One hundred percent of the NaCl group corresponds to 1180 pg/ml (C3H/HeN), 2570 pg/ml (C3H/HeN + C3H/HeJ), and 3180 pg/ml (C3H/HeJ). ∗∗∗, p < 0.001 vs control group (NaCl); ###, p < 0.001 vs LPS pretreated cells (LPS) based on ANOVA, followed by Tukey’s multiple comparison test. B, LTA-induced cross-tolerance is not transferred to cocultured TLR2−/− cells. Peritoneal cells (5 × 105/ml) peritoneal cells from either CD1 wild-type or TLR2−/− mice, or mixed cells from both mouse strains (1 × 106/ml, 200 μl/well) were preexposed to medium, 10 ng/ml LPS, or 10 μg/ml LTA for 20 h, washed, and restimulated with 100 ng/ml LPS for 6 h for determination of TNF production. Data from one experiment performed in triplicate are expressed as percentage of respective saline control and are shown as means ± SEM. One hundred percent TNF of the NaCl group correspond to 20 pg/ml (CD1), 50 pg/ml (CD1 + TLR2−/−) and 25 pg/ml (TLR2−/−)). ∗∗∗, p < 0.001 vs control group (NaCl); ###, p < 0.001 vs LPS pretreated cells (LPS) based on ANOVA, followed by Tukey’s multiple comparison test. Overactivation of the immune system in the course of systemic infection creates a life-threatening situation characterized by pathophysiological alterations of the microcirculation that finally can lead to multiorgan failure and death (39, 40). Inhibition of inflammatory processes after a primary proinflammatory response may represent a mechanism of the host’s immune system to limit autodestruction caused by sustained systemic inflammation. In animal models of endotoxic shock, LPS- and TNF-α-mediated liver damage as well as fulminant infection with high numbers of bacteria, suppression of cytokine production, and prevention of tissue damage as well as of mortality were observed when a nontoxic dose of LPS was administered several hours or days before challenge (37, 41). We demonstrate here that acquired tolerance to the immunostimulatory activity of a bacterial component is not restricted to LPS, but also is found in response to LTA from Gram-positive bacteria. Moreover, our data showing cross-desensitization of LPS and LTA suggest a general mechanism of suppressing proinflammatory responses after repeated contact with components of Gram-positive or Gram-negative bacteria. Our findings are in line with a previous report showing suppressed cytokine production on stimulation of LPS-pretreated human monocytes with whole S. aureus (42). However, contrasting results were obtained by others showing unaltered or even increased cytokine production upon stimulation with muramyl dipeptide or whole S. aureus after LPS-tolerance induction (11, 43). These discrepancies may be attributable to species differences, as guinea pig and rabbit macrophages were used there, or to overall different experimental settings. The results presented here confirm and extend recent findings by Sato et al. (24) who demonstrated cross-desensitization of murine macrophages by LPS and the mycoplasmal lipopeptide macrophage activating protein 2 (MALP-2), which has been shown to signal also via TLR2 (21). As a major difference, in our setting, LPS pretreatment completely inhibited TNF release in response to subsequent LTA stimulation, whereas only a partial reduction of MALP-2 induced TNF production by LPS-desensitized macrophages was found by Sato et al. (24). It recently has been shown that lipopeptides contaminating commercial LPS preparations signal via TLR-2 (44). Such contamination might contribute to the cross-desensitization with LTA, although a highly purified endotoxin was used. However, we demonstrate in Fig. 3⇑ that preexposure of wild-type C3H/HeN macrophages with 1 ng LPS/ml already induced significant cross-desensitization to LTA restimulation, whereas no significant reduction of LTA-induced TNF release was observed in TLR4-mutated macrophages from C3H/HeJ mice pretreated with LPS up to 10 ng/ml. This strongly argues for a TLR4-dependent mechanism of cross-desensitization in response to the LPS concentrations used throughout the study (1–10 ng LPS/ml). In the last years, our understanding of the molecular mechanisms underlying desensitization of macrophages by exposure to LPS has increased considerably. Expression of CD14 is unaffected or even increased after LPS stimulation, thus it is highly unlikely that tolerance is mediated via expression of this LPS receptor (45, 46). Refractoriness in response to LPS preexposure has been shown to be associated with altered G protein content (47, 48), phospholipase D and phosphatidylinositol-3 kinase expression (49), and compromised protein kinase C activation (50). Others described suppressed signal transduction via both the mitogen-activated protein kinase cascade (30, 51, 52, 53) and I-κB kinases, resulting in impaired transcription of NF-κB- and AP-1-regulated genes (30, 54). A predominance of transactivation-inactive p50/p50 homodimers of NF-κB also has been found in LPS tolerance (55, 56). Recent data showing suppression of IL-1R-associated kinase activation and association with myeloid differentiation protein 88 (57) and decreased surface expression of TLR4 on LPS-tolerized cells (58) support the notion that very early steps in LPS signaling are altered after LPS exposure. Further evidence for this was provided by Medvedev et al. (30) who reevaluated in vitro desensitization by IL-1 and TNF, showing induction of cross-tolerance to LPS via the IL-1 receptor but not the TNF receptor. Intriguingly, signal transduction of the IL-1R, the LPS receptor TLR4, and TLR2 use similar signaling molecules (32, 34, 59). Our findings that preexposure to LTA inducing signaling via TLR2 results in hyporesponsiveness to TLR4-mediated LPS signaling and vice versa add further indirect evidence for a suppression of common signaling molecules shared by TLR2 and TLR4 and IL-1R, i.e., myeloid differentiation protein 88, IL-1R-associated kinase, TNF receptor-activated factor 6, or NF-κB-inducing kinase in desensitized macrophages. Alternatively, activation of the IL-1R/TLR signaling pathway could result in formation of a specific nuclear suppressor of LPS-induced gene transcription, as suggested previously (60, 61). Previous studies suggested that hyporesponsiveness after pretreatment with LPS was mediated by the action of endogenous mediators such as IL-10, TGFβ, or IL-1β produced on primary or secondary LPS stimulation (31, 38, 42). Others postulated the existence of soluble yet unidentified suppressor molecules of TNF expression during LPS tolerance (62, 63). Our findings that macrophages from mice deficient in TLR2 or carrying a nonfunctional mutant of TLR4 were not rendered refractory by LTA or LPS pretreatment, respectively, when cocultured with wild-type macrophages argue against soluble mediators of desensitization unless factors requiring the presence of TLR2 or TLR4 (i.e., yet unknown soluble ligands of TLR2 or TLR4) are involved. However, we cannot rule out that the effects of LPS/LTA pretreatment in vivo, i.e., protection against LPS shock and liver injury, are mediated in part by endogenously produced cytokines. Thus, macrophage-derived products such as TNF and IL-1β, which are released during the LPS/LTA pretreatment, might contribute to the desensitization of target cells (e.g., hepatocytes) against the toxicity of subsequent LPS/LTA challenge in vivo, e.g., by inducing heat-shock and other acute phase proteins (64, 65, 66). In conclusion, in the present study, we demonstrate cross-desensitization of primary murine macrophages by highly purified LTA and LPS in vitro and cross-tolerance to LTA/LPS-induced TNF production and liver damage in vivo. Our data provide evidence that macrophage desensitization is not a LPS-specific phenomenon but that common signaling pathways shared by TLR4 and TLR2 are impaired during macrophage refractoriness. Finally, our findings suggest that endogenously produced soluble factors do not suffice for macrophage desensitization in vitro. The excellent technical assistance of Margarete Kreuer-Ullmann and Leonardo Cobianchi is greatly appreciated. ↵1 This work was supported by grants from the Deutsche Forschungsgemeinschaft (Ha2567/3-1; Schu828/1-5) and the Bundesministerium für Bildung und Forschung (01KI94750; to R.R.S.). M.D.L. received a stipend from the Landesgraduiertenförderung Baden-Wuerttemberg. K.S.M. was supported by the Boehringer Ingelheim Foundation. ↵3 Abbreviations used in this paper: LTA, lipoteichoic acid; TLR, Toll-like receptor; GalN, d-galactosamine. ↵4 B. Opitz, N. W. J. Schroeder, I. Spreitzer, K. S. Michelsen, C. J. Kirschning, W. Hallatschek, U. Zaehringe, T. Hartung, U. B. Goebel, and, R. R., and Schumann. Toll-like receptor (TLR)-2 mediates treponema glycolipid and lipoteichoic acid (LTA)-induced NF-κB translocation. Submitted for publication. Bergmeyer, H. U.. 1983. Methods of Enzymatic Analysis Weinheim, Verlag Chemie. Schade, F. U., R. Flach, S. Flohé, M. Majetschak, E. Kreuzfelder, E. Dominguez-Fernandez, J. Börgermann, M. Reuter, and U. Obertacke. 1999. Endotoxin tolerance. In Endotoxin in Health and Disease. H. Brade, S. M. Opal, S. N. Vogel, and D. C. Morrison, eds. Marcel Dekker, New York p. 751.